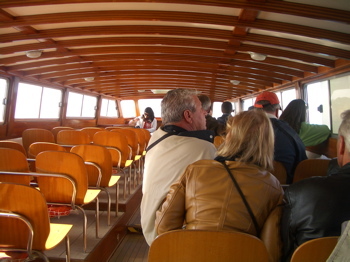 Cruise line organized Venice water bus transfer, pay for it or not? "Cruise line organized Venice water bus shuttles take Mediterranean cruise passengers straight from the ship to Venice St. Mark's square..."
Taking the cruise ship organized Venice water bus is probably the most practical, and quickest, option when it comes to reaching downtown Venice from your cruise ship. Just to avoid any confusion - this article will be talking exclusively about water buses organized by your cruise line, not the regular public transportation water buses. ACTV public transportation vaporettos do not depart from Stazione Marittima. The closest public transportation water bus (vaporetto) stop to the Venice cruise terminal is at Piazzale Roma. If you are interested in catching a public transportation vaporetto in order to get to St. Mark's square from the port of Venice, you can find more information in our article Vaporetto basics for Venice cruisers. The only case in which you would see local transportation water buses depart from Stazione Marittima would be on ships' turnaround days. You can read more about those special lines from Alilaguna in our article Venice vaporetto for cruisers. So, let's get back to your cruise line organized water bus shuttles. 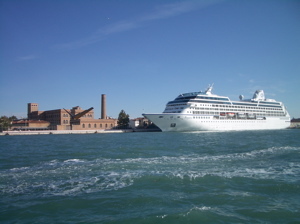 Their purpose is to take Mediterranean cruise passengers straight from the ship to Venice St. Mark's square. They play the same role that regular land shuttle buses would play in any other port. These water shuttles will depart from literally a few steps away from the ship, after your ship has docked. There normally is a charge taking this cruise line organized Venice water bus shuttle service. You will need to inquire about the price directly on the cruise ship. or an unlimited use ticket (especially in case your ship has an overnight in Venice). Be in the know: If you decide to go with the cruise line organized Venice water bus shuttle, it is a good idea to sign up for the tickets the day before with the desk in charge of selling them (usually the shore excursions/reception desk onboard). There is the possibility of your tickets being charged straight onto your ship charge card right before you board the shuttle boats on the pier, just remember in that case you will be one of the few hundred other guests who waited until the last minute to do the same! So, be one of those who simply flash their pre-purchased tickets, jump onboard, and leave the long queue behind. Normally, ship organized shuttle boats will be shuttling between the ship and the downtown drop off point all day. There is no set schedule for them but you will never find yourself waiting for one more than 10-15 minutes or so. The first boat will usually depart after the ship’s arrival and local authorities’ clearance. If you’re one of the above, you will not regret buying the ship organized Venice water bus transportation... not just for one, but also for both days of your stay in Venice if you have an overnight. If you will be taking a cruise line organized shore excursion to Venice during your stay, and that tour will give you an option of dropping off and staying downtown Venice, that will take care of getting into Venice but you will still need a ticket to return to the ship. In this case, the good thing is that you don't have to decide how you will be getting back to the cruise ship beforehand. If you do decide to leave your tour behind and find your own way back to the ship, you can always be charged a one way trip back on the cruise line organized Venice water bus shuttle by the boat itself, straight to your ship charge card. Many ships will have an overnight in Venice and in that case, purchasing an unlimited use ticket for cruise line organized transportation sounds like a great idea to maximize your stay. Truly, if you are a healthy person capable of walking a couple of hours a day, I cannot see you being happy with only one visit downtown Venice in a period of about 34 hours. People normally do it at least 3 times: once first thing in the morning until early afternoon of day one; early evening of day one; early morning of day two until about an hour before sail away. Many people think, when booking their cruise line organized Venice water bus transfer tickets, the boat will take them down the Venice Grand Canal. But that is not the case. 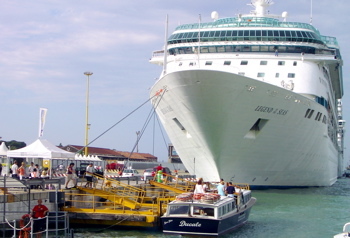 From where the ship docks, your cruiseline organized water bus cannot reach the Venice Grand Canal and will therefore use the wider, and not so winding, Giuddeca Canal. Is it too bad you will be taken down this canal? Never, not even after 5 years of sailing down that canal did we ever find it boring… and neither will you. It is also flanked with beautiful houses, palaces, churches and gives you a good taste of what awaits you when you get off the boat. Sailing down the Giuddeca Canal you will also get to see a domineering red brick building which is a relatively new Hilton hotel set in the former Molino-Stucky mill & granary, quite an impressive structure. Your cruise line organized shuttles will drop you off as close to St. Mark’s square/ Piazza San Marco as possible. 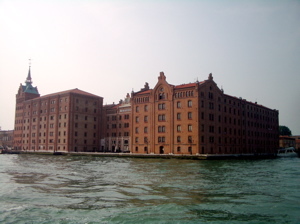 In most cases, that will be at Riva dei Schiavoni, a Venice waterfront area to the right hand side when facing St. Mark’s square from the Venice water bus shuttle. If your cruise line organized Venice water bus drops you off there, it will be right by one of the San Zaccaria local vaporetto stops/stations which is handy if traveling to Murano some time during your stay in Venice. It is only 2 bridges away from St. Mark’s square (5 minutes walk), but as this is where you’ll be coming back to later at night to catch the same cruise line organized Venice water bus back to the ship, it helps to remember to look for another handy landmark: the monument of King Vittorio Emanuelle II on his horse, locally called “impiracolombi”. Now, you might not remember that very term but if I tell you it translates to something like “pigeon-skewer” which refers to his long, thin sword he’s holding up in the air… now, that might stick with you! 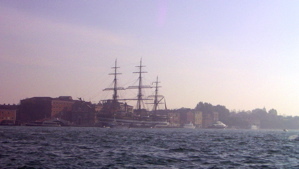 Even if there are two ships docked in Venice at the same time, they will most likely be using the same drop off point at Riva dei Schiavoni. There is a very small chance, but in case those docks get too busy, another option is the docks by vaporetto stop San Marco Valareso which are very close to the Harry's bar. 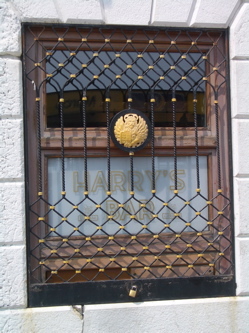 Yes it is THE Harry’s bar that you all know about from that song and stories about Hemingway getting drunk on Bellini’s there. If you do get dropped off near there, there isn’t much to tell you but that you’re looking at Harry’s bar, no screaming neons, no big signs or, God forbid, Papa’s photo somewhere in the window. So, to make it simple… if you’re dropped off further to the left hand side when facing St. Mark’s square from the shuttle boat - that’s near Harry’s bar. Get off the shuttle boat, turn right, cross one little bridge and you’ll be entering St. Mark’s.